At 4x Fun event, Samsung just announced Galaxy A9 2018 edition. But it’s not a usual mid-range device; in fact, it’s the world first smartphone to hold quad camera setup, on the back. In the new Samsung Galaxy A9, first and foremost there is a main 24 MP f/1.7 camera. Then, an Ultra Wide 120-degree lens with 8 MP f/2.4 camera. Following, a 5 MP f/2.2 camera for more depth of field. Lastly, a 2x optical zoom telephoto lens, coupled with a 10 MP f/2.4 camera setup. All the four cameras are aligned vertically, on the back. While the camera is the main takeaway of the Samsung Galaxy A9, the internals are pretty impressive as well. Being launched in the mid-range segment, the Galaxy device surprisingly comes with 8GB RAM and 128 GB storage (A 6GB RAM and 128GB storage option are also available). For smooth processing, there is an octa-core Snapdragon 660 SoC which is combined with 3,800 mAh of battery life. The best thing about Galaxy A9 is that Samsung has not compromised on any spec, even after inducing the quad-camera. For instance, the device has a 6.3-inch Full HD+ screen with a resolution of 2220×1080. Also, the selfie camera is equipped with a 24 MP F2.0 sensor. The Galaxy device comes in Caviar Black, Lemonade Blue, and Bubblegum Pink. And all of them have some gradient look on them. For a long period of time, Samsung has focused on their high-end devices. Form Samsung Galaxy S9 to the recently launched Samsung Galaxy Note 9, Samsung has always shipped feature-packed flagship killers. However this time, they are applying a different strategy, altogether. In September, Samsung Mobile CEO DJ Koh said to CNBC, “I have changed my strategy this year to bring technology and differentiation points starting from the mid-end.” It will be interesting to see how phone users respond to the latest strategy change from Samsung. 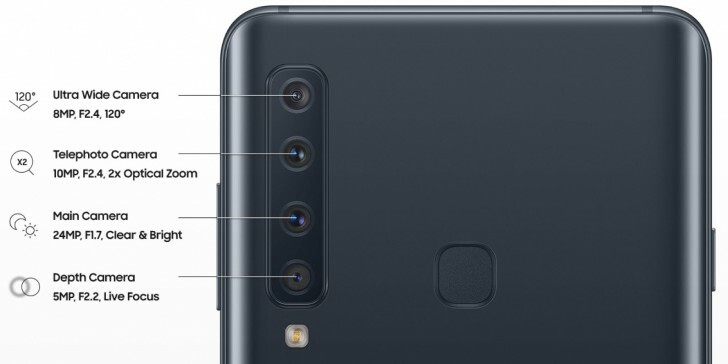 Regarding the Galaxy A9 (2018) price, the device will cost approximately $724 with sale starting in November.